classic, best-selling guide to self-improvement through self-hypnosiscompletely updated, with new techniques. What would you and your life be like if you could reach your peak potential and become the person you want to be? Any of the things you imagine could be yours if you take back control over your thoughts and feelings by following the principles and methods of strategic self hypnosis, which have been used successfully by thousands of people since 1982. Now these proven, easy-to-use methods have been updated to provide you with even more effective techniques that will unleash the power of your creative imagination, allowing you to: stop suffering from stress and worry; overcome bad habits; reach your true potential; achieve maximum performance in work, study, sports and your personal life; overcome pain and negativity. 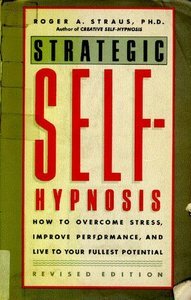 Strategic Self-Hypnosis gives you the step-by-step guidance and techniques you need to break down self-imposed barriers and gain full control over your mind and body. Dr. Straus shows you how to tailor a life-changing strategy to your needs and goals and how to begin implementing your action plan immediately. Youll learn the three basic principles of strategic self-hypnosis: how to relax and let go, how to vividly envision the new realities you want for yourself, and how to allow yourself to make it happen. And to have fun in the process! With Strategic Self-Hypnosis, you will be able to make your life work out the way you want it to.